Chris Davis has been invited to be a charter member of Trial Masters which recognizes experienced attorneys for their outstanding performance and accomplishment in the courtroom taking cases to verdict. Membership in Trial Masters is limited to those attorneys who have tried 35 or more trials to verdict and who have an impeccable bar record. Trial Masters recognizes that attorneys with significant trial experience stand out from the colleagues and are more capable of providing their clients with outstanding advocacy. 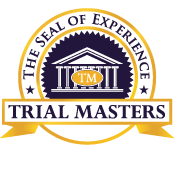 Attorneys that have been invited to become Trial Masters members have substantial experience in the courtroom and a winning trial record. Based on the purely objective measure of experience in the courtroom over a period of time, Trial Masters differentiates itself and its members from other “Best Lawyers” awards and “Top Lawyers” lists that are more subjective in nature.